"A traditional Mexican dish without the work! I couldn't believe that something that good was SO easy to make. The achiote paste can easily be found at most Mexican grocery stores. Mouthwatering!!!!" Combine the onion, habanero peppers, lime juice, and salt in a bowl; cover and refrigerate while preparing and cooking the pork. Use rubber gloves when preparing the habanero peppers and avoid touching your eyes, nose, or skin while slicing peppers. Place the guajillo peppers in a bowl; pour enough hot water over the peppers to cover. Allow to soak until the peppers are softened, about 10 minutes. Heat the oil in a large skillet at medium-high heat. Season pork with salt and pepper; cook in the hot oil until completely browned, 15 to 20 minutes. Transfer the pork to a slow cooker. Combine the guajillo peppers, orange juice, vinegar, garlic, and achiote paste in a blender; blend until smooth. Pour the sauce over the pork cubes in the slow cooker. Cook on High until the pork easily falls apart, 6 to 8 hours. Remove the pork to a serving dish and shred with 2 forks. 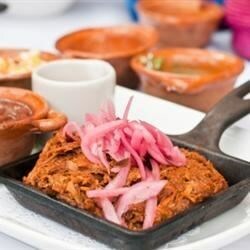 Pour the achiote sauce over the shredded pork. To serve, top with the onion-habanero salsa. This was a hit!!!! Didn't make enough though. Definitely will make again. I generally love Mexican food even very spicy recipes. But this one I really did not like. First time I tried Achiote paste. Can't say I am a great fan.